I have a confession to make. I don't like Spas, I find them a little boring. Padding around in bathrobes just isn't my thing. Of course the treatments are lovely and you wouldn't find me refusing a trip to one but it wouldn't be my first choice for something to do. I do love a pamper though, just at home, to my schedule. 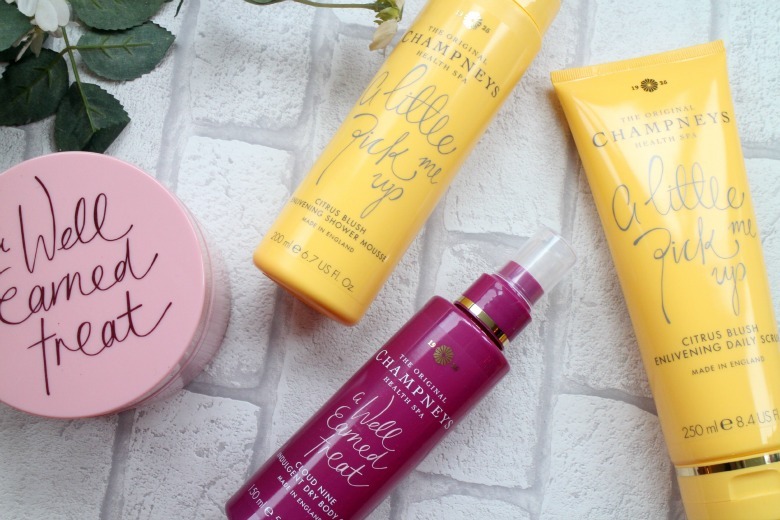 Luckily for me Champneys understand there are people like me who want to enjoy a 'Champneys moment at home but there was perhaps a few products missing from their range and their packaging needed a little rebranding so that's what they did. I have to say looking at Champneys new packaging I feel like they marry the combination of the Champneys brand I know of, albeit from afar, of one of luxury with a younger, fresher feel. I think it has a broad appeal for both teens without alienating it's regular customer whilst not appearing cheap and alienating the older woman. The concept of the new range of products is simple for you to choose from whatever your pampering needs may be. Is it a 'Well Earned Treat' after a tough week, 'A Little Pick Me Up' after a sleepless night or a need to feel 'As Good As New' after a difficult day there is something for you. 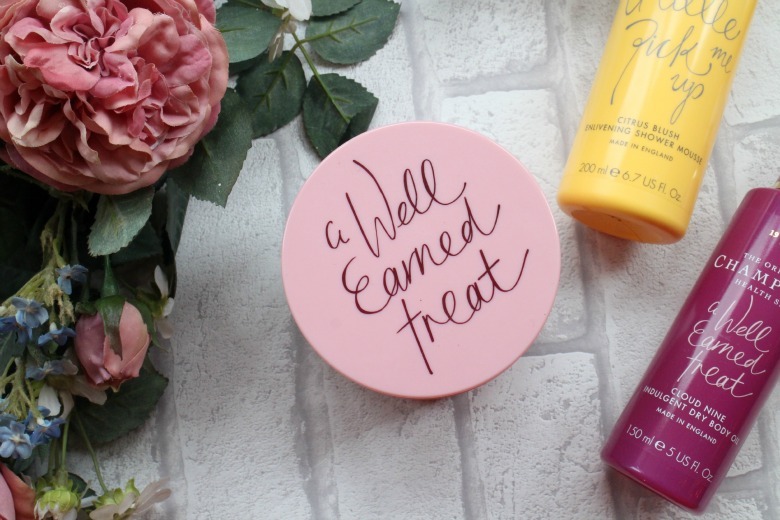 From the 'Well Earned Treat' range I received the Champneys Summer Dream Rewarding Butter Souffle* which is a pleasant aroma of summer fruits that I could happily lick it. Yes I could. Former Champneys fans may remember this as Distant Shores. This really does feel luxurious and something a little more special than typical thick body butters and at this time of year it does make a difference to the abundance of cinnamon and wintery scents we're seeing. As price points go this is fair at £10 and you can snap it up now on a 3 for 2. I've definitely got my eye on other products in the line up such as Bubble Heaven and the salt scrub when the sun returns once again. It makes a more mature alternative to Soap & Glory's Sugar Crush. If Sugar Crush is your thing you'll enjoy the Citrus Blush products from the 'A Little Pick Me Up' range. Citrus, lemon and cardamon add some zing to your morning shower. Scent aside I love the packaging particularly of the two products I have. Citrus Blush Foaming Shower Mousse* makes an enjoyable change from the usual gels and as such feels a little more luxurious. The pump also makes things easier as there's no danger of bottles or tubes slipping out of hands. The Citrus Blush Enlivening Daily Scrub* is in a tube which avoids the typical scooping of tubs so there's less waste and you have a cream formula with a gritty texture rather than a heavier scrub. It's more a polish so perfect for this time of year when you're having to get scaley Winter skin out for those Christmas parties! And finally another product from the 'Well Earned Treat' range is Cloud Nine Indulgent Dry Body Oil*, again absolutely perfect for this time of year both in scent and texture. The scent is one of plum and orange, blended with vanilla and aromatic woods which can be simply spritzed onto skin and massaged in - if you're lucky enough to have a man at home maybe this would make for a night time massage. Alas if like me any massages are done by myself a spray oil goes some way to getting product on the back! I have my eye on the Heavenly Days range, especially their Pillow Mist and think you could easily put together your own package of products for a friend or family member, whatever their age or needs. I'm sure plenty of people need something for any of the ranges whether battling sleepless nights, or want a well earned treat after a long day spent Christmas shopping. 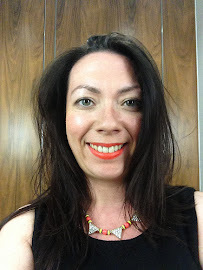 The new Champneys products are a big hit with me, have you tried them? I'd like to try them and I especially love the packaging. Have a great weekend! Agreed, a morning would suit me fine! I do love a good pedicure at a spa! I do understand what you say about padding around in a robe.... Enjoy those lovely products, they look wonderful! Oh yes a pedicure is my favourite treatment, sitting back and just letting some work on my feet - that is bliss!